Casimir, the second son of Casimir III, King of Poland, was born in 1458. From the custody of a very virtuous mother, Elizabeth of Austria, he passed to the guardianship of a devoted master, the learned and pious John Dugloss. Thus animated from his earliest years by precept and example, his innocence and piety soon ripened into the practice of heroic virtue. In an atmosphere of luxury and magnificence the young prince fasted, wore a hair shirt, slept upon the bare earth, prayed by night, and watched for the opening of the church doors at dawn. He became so tenderly devoted to the Passion of Our Lord that at Mass he seemed quite rapt out of himself; his charity to the poor and afflicted knew no bounds. His love for our Blessed Lady he expressed in a long and beautiful hymn, familiar to us in English as Daily, Daily, Sing to Mary. At the age of twenty-five, sick with a long illness, he foretold the hour of his death, and chose to die a virgin rather than accept the life and health which the physicians held out to him in the married state. The miracles wrought by his body after death fill an entire volume. The blind saw, the lame walked, the sick were healed, a dead girl was raised to life. At one time the Saint in glory, seen in the air by his army, led his Catholic countrymen to battle and delivered them by a wondrous victory from the schismatic Russian hosts. One hundred and twenty-two years after his death Saint Casimir's tomb in the cathedral church of Vilna was opened, that the holy remains might be transferred to the rich marble chapel where it now lies. The place was damp, and the very vault crumbled away in the hands of the workmen; yet the Saint's body, wrapped in robes of silk, still intact, was found whole and incorrupt, and emitting a sweet fragrance which filled the church and refreshed all who were present. Under his head was found his hymn to Our Lady, which he had had buried with him. Reflection. 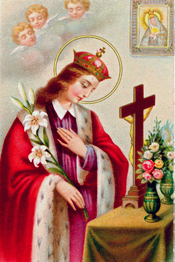 May the meditation of Saint Casimir's life make us increase in devotion to the most pure Mother of God  a sure means of preserving holy purity in our own soul. The kingdom of heaven suffers violence, and the violent bear it away.